"Docker containers wrap up a piece of software in a complete filesystem that contains everything it needs to run: code, runtime, system tools, system libraries - anything you can install on a server. This guarantees that it will always run the same, regardless of the environment it is running in." NoMachine software, as well as remote desktops and applications deployed via NoMachine, can be dockerized. Given that Docker is already installed on the host machine, to run NoMachine server inside Docker it's enough to build an image from the Dockerfile and launch it. Step 2 - Copy content of the Dockerfile below to: nomachine/Dockerfile. Adapt the Dockerfile to your needs. Set a different port if necessary (see points d and e below). You can specify multiple ports by reiterating the -p option, e.g. The Dockerfile is a script which contains a set of instructions used to build the container image. - value of NOMACHINE_PACKAGE_NAME with the name of the newest NoMachine package you intend to install (you can see in the download page). - Value of NOMACHINE_MD5 with the MD5 sum of your package (check it also in same download page). b) By default this Docker file will run a MATE desktop environment, you can adjust it by replacing mate-desktop-environment-core with the desktop of your choice. c) It will create the NoMachine user with 'nomachine' as a password, you can specify a different username and password and repeat instructions for creating additional users. d) Note that there is no need to expose ports in Dockerfile, this can be done by using the -p option when running the 'docker run' command. E.g. to let users run web sessions. This applies to NoMachine servers supporting sessions by the web only. # Installation of ssh is required if you want to connect to NoMachine server using SSH protocol when supported. # Comment it out if you don't need it or if you use NoMachine free. On some systems, e.g. Ubuntu 14.04 , AppArmor blocks many operations. apparmor="DENIED" operation="ptrace" profile="docker-default" pid=3004 comm="nxexec" requested_mask="read" denied_mask="read" peer="docker-default"
comment out the corresponding line (in this case line 16) in the /etc/apparmor.d/docker file. Finally restart the container, NOT the docker service. This point applies also to Mac. This use case provides some example to illustrate how to set-up a browser, office suite, VOIP program and e-mail client in a Docker and run it as single application in a NoMachine custom session. 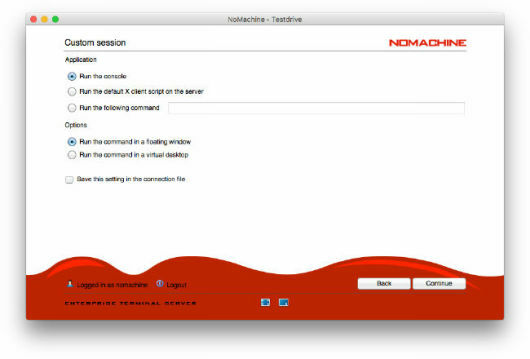 Note: the NoMachine product installed on the remote Linux server host must support the Linux virtual desktop functionality, e.g., Workstation, Terminal Server. Connect by NoMachine to the Linux server host where you have installed a NoMachine product with support for the virtual Linux desktop functionality. In this example, Workstation has been installed. In the NoMachine client GUI click on 'Create a new desktop or custom session'. Then click on 'Create a new custom session'. In the 'Custom session' panel of the GUI select the 'Run the following command' option and specify there the proper command to run the dockerized application on the Linux host. Examples in the next paragraphs provide also the command to be specified in this GUI field. - The remote host is Linux. - Docker is installed on the host machine. - A NoMachine server, e.g. NoMachine Workstation, is installed on the same host, but not in the Docker container. - Instructions to set-up a dockerized application have to be executed in a terminal as normal user. Step 1 - Get the browser-box Docker image. docker build -t sameersbn/browser-box . Step 1- Get the LibreOffice Docker image. Terminating a custom session doesn't terminate a docker container. To terminate it you may use the docker kill <container ID> command.